Do you stay up late working on your blog? Or maybe you're just up reading blogs? 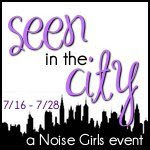 The Noise Girls understand and so we've put together the Blogging Babe prize package! Check out all of the great products, grab your coffee, and enter to win!